Jenelle Eason attacks Jeremy Calvert, he blasts back by filling his tweets with uppercut ?? Teen Mom 2 star Jenelle Eason is all but drowning in bad publicity, thanks to her controversial husband David Eason and her recent road rage incident in which she reportedly pulled a gun on a man at his home. As the troubled reality star gets sucked down further and further into the whirlpool, she seems to be desperately clawing and scratching at anyone and everyone within reach. After having her Facebook page suspended for 30 days, Jenelle took to Twitter to lash out at those who have recently offered up criticisms of her actions, including Leah Messer’s ex-husband Jeremy Calvert, Chelsea Houska’s dad Dr. Randy Houska, and Teen Mom news source The Ashley’s Reality Roundup. Dr. Randy Houska responded to Jeremy’s tweet by making a joke referencing early reports that there were two children in the vehicle with Jenelle at the time of the incident: “Don’t worry, she was being supervised by two young children,” he tweeted. The Ashley's motto in life has always been "If you have a problem with everybody, the problem is you." 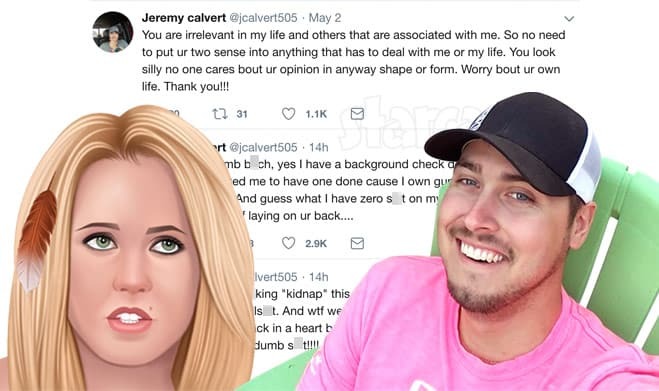 Meanwhile, Jeremy Calvert caught wind of Jenelle calling him out on Twitter, and he returned to fill his tweets with uppercut — BIG TIME! Before we get started, I should mention that David Eason made a post in which he stated that Jenelle was at risk of being kidnapped during the road rage incident. I have no idea what he meant, and he didn’t clarify, but Jeremy references that comment so I felt I should mention it. Jenelle has been essentially Twitter silent for about 15 hours at the time of this post. Stay tuned.